This Bluetooth Bose Aviation Headset A20 is a next-generation pilot headset. Battery powered with twin GA plugs. Also features an electret mic with Bluetooth control module. Portable design enables use in multiple aircraft, fitted with a straight cable. 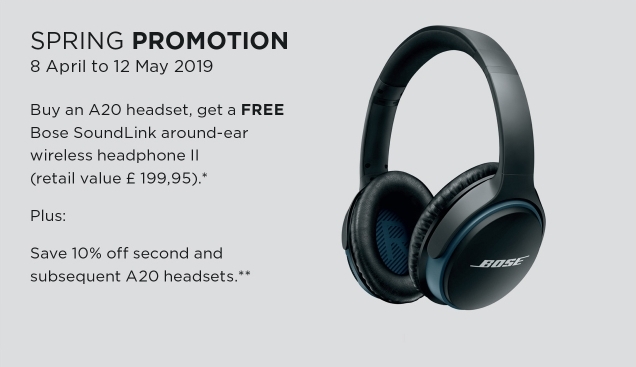 Link to Redeem your Bose Promotional Gift. the a20 aviation headset is engineered to be more comfortable and provide more noise reduction than any headset we've ever made, while still delivering the clear audio you expect from bose. and now there are more features than ever, including: a bluetooth audio and communications interface; customizable audio prioritization control; intuitive plug-and-play operation; a high-performance microphone and an optional coil cord. and weighing just 340 g, it's still one of the lightest active noise cancelling headsets out there. no other headset offers this unique combination of features and benefits. The A20 headset gives you 30% greater noise reduction than conventional aviation headsets, so you'll enjoy a peaceful flight from short stops to long hauls. And at just 340 g, with sheepskin cushions and minimal clamping force, it's one of the lightest and most comfortable aviation headsets you'll find. All designed to let you focus on what matters flying. Plug-and-play convenience means the headset is ready to fly when you are no need to press a lot of buttons first just to activate it. the ergonomic control module includes an auxiliary audio input with intercom/aux priority switching, ideal for dedicated gps and traffic warning systems. it also features a customisable audio prioritisation control with mute and mix settings, and flexible power circuitry with auto-on that switches to and from battery power and aircraft power. select models also include bluetooth connectivity for taking calls or listening to music. Link to BOSE Professional pilot Program for Airline/Instructor Pilots. Significantly greater noise reduction - you'll be amazed at how quiet the A20 headset is! Improved level of comfort - 1/3rd less clamping force than most other aviation headsets. Clear audio - famous Bose quality is evident in both the speakers and microphone. Auxiliary audio input - so passengers can listen to music. Priority switching - you decide which audio source you want to hear. The ergonomic control module features independent volume controls. Runs for over 45 hours on just 2 AA batteries. Weighs just 12 oz., includes carrying case, five year warranty.